Girgarre Moosic Muster is approaching its 10th anniversary on January 8th to 10th, 2016. Folks there are planning to raise the roof with celebrations. Over ten years the muster has encouraged and taught thousands of beginners how to play music. For the past ten years the festival has provided a platform and exposure for many established and emerging musicians, songwriters and bands. For ten years it has promoted the personal joys of making your own music, whether you are into country, folk, blues, traditional Aussie bush songs, bluegrass, Celtic, pop, gospel or more contemporary styles. 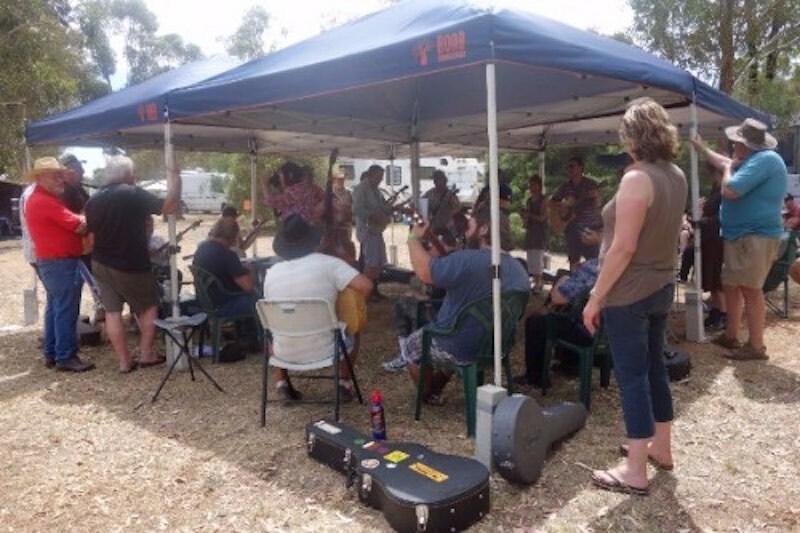 From the muster has sprung monthly jamming and teaching sessions called Jigarre Jammin’, which attract up to 70 musicians every month to Girgarre. The Girgarre music scene has also given birth to several new bands who now “put back” by performing within their own communities in northern and central Victoria. Through it all the muster has kept its true heart – its community base – and has never charged an entry fee. It’s the most friendly and affordable acoustic music event in Victoria. It’s the most friendly and affordable acoustic music event in Victoria. There is something about this tiny dairying town of fewer than 200 residents and its dynamic leadership that draws supporters in and keeps them coming back. Ten years ago three musicians sat on hay bales to perform at Girgarre’s earliest farmers’ market. It was at the height of the millennium drought which devastated large areas of south-eastern Australia. Girgarre was suffering badly, watching its families, jobs and services drift away. Soon those musicians began bringing friends, and the muster was born. It now attracts more than 1500 music lovers and skilled players from city and country, making it a major fixture on Victoria’s acoustic festival circuit. The tutors and bands still work free of charge. As usual the coming muster will feature free public concerts on two stages, open mike sessions, more than 30 free workshops, continuous jamming and even free instrument loans, courtesy of sponsors such as Fender. The original musicians will return to appear together on stage. New offerings include old-timey sessions, a jokes competition and a tutorial on getting the best sound from your gig venue. Workshops will cover guitar, banjo, dobro, autoharp, mandolin, ukulele, harmonica, percussion, double bass, violin, chords, harmony singing, song writing and poetry. For the one-day free Kids’ Muster, there are circus-style fun activities for the first time and the popular Limberjack dolls will be back, along with craft, poetry, ukulele and more. For muster director and co-founder Jan Smith, the continual growth of the muster is a source of pride which she attributes to her passionate supporters. Everyone is a volunteer and gets involved because they just love the music and the fun it brings. We give special support to beginners of all ages, and to those musicians who may be the only one making music in their small township. This anniversary event is going to be a celebration of what you can achieve in a country community with friendliness, enthusiasm and hard work – Jan Smith. Girgarre is located midway between Echuca and Shepparton in northern Victoria. Muster venue is the air-conditioned Girgarre hall and park in Winter Road. Camping is on-site (small fee required) and food and hot and cold drinks will be available. The highly popular Girgarre farmers’ market takes place on the Sunday at the site, with bands playing. The full program is now on the website.